There are still only around 80 Irrawaddy river dolphins in the Mekong River and human-induced environmental pressures such as destructive fishing practices, large infrastructure projects, pollution, and loss of habitats mean that threats to the dolphin population are always present. One of the main causes, if not the leading cause, of dolphin mortality is the use of gillnets. Gillnetting which is a popular fishing practice, if used in prohibited areas or in dolphin deep pools, is disastrous for the ‘living national treasure’ of Cambodia. This is where the river guarding teams of the Mekong Flooded Forest landscapes (MFF) conduct a vital and unique role. 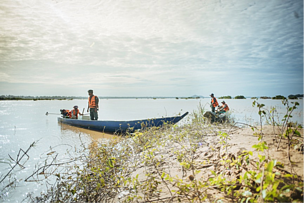 Supported by the Fisheries Administration (FiA) of the Cambodian Government, there are currently 72 river guards spread over 16 guarding outposts in Kratie and Stung Treng province. The river guard’s responsibility is to patrol the protected areas within the 27,450 km2 MFF area, monitoring activity and identifying illegal practices in line with government laws and regulations. Additionally, they are responsible for identifying individuals who have broken the law. Either through confiscating illegal fishing equipment and issuing warnings or working with WWF law enforcement team and the FiA to prosecute offenders in the courts. WWF-Cambodia supports the river guards through providing intensive and detailed coaching on river guard protocol and the provision and training of supplies and equipment such as speedboats, uniforms, and GPS devises. It is this collaboration and support which led to the successful results we had from April-September. Overall, a total of equivalent to 2,164 days of patrolling were conducted. The patrols and reinforcement of training, supplies, and equipment has led to an immediate outcome of over 1,187 of gillnets being confiscated equivalent to 61,466 meters and 2,478 hooks equal to 5,635 meters over all 16 outposts. Moreover, there were 9 cases of electro fishing out of which 8 sets of electro fishing tools and 5 boats were confiscated. 462 fishermen were educated and 48 warning letters were issued. As a result of this strong law enforcement, 5 new dolphin calves and zero dolphin mortality were recorded during the reporting period. To keep these great results ongoing and productive, monthly meetings will continue to be conducted together with monitoring, coaching, and problem solving to give support to all river guards who are essential for the health of the Mekong River and its ecosystem. Some challenges and threats remain to be tackled within the landscape. One of the challenges is to secure fund to continue supporting this law enforcement work. Additionally, plans for dam construction such as in Sambo and Steng Treng will be the major threats to the survival of the Mekong Dolphins and other biodiversity in the river. River guards are doing patrol at Mekong River in Kratie.